Under glaring sunshine or cloudy skies-eyes need protection from damaging UVB-UVA rays. Squint alert times used to mean paying up for well fitted durable shades that shield peepers- multi-tasking for a range of activities...from traveling to sporty fun. Both are super lightweight, stay put without leaving a mark on our nose bridge post hours of wear no matter what, have frames that via "Glide Technology" don't yank out our precious tresses-putting on/off (made out of nylon material = Grimalid TR-90), with scratch tough polycarbonate lenses that are coated vs glare-just like pricier brands. If traveling minimally-these styles-can do it all... from beach, to running trails- to streets. 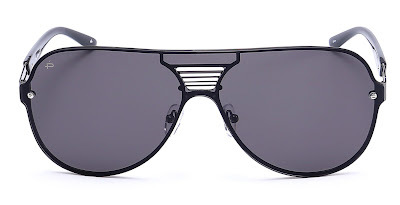 The Hitman $29.95- Limited edition double bridge-retro sunglasses (also available in gunmetal) muscles up with polarized lenses that block 100% UVA/UVB rays, have anti-glare coating, scratch resistant lenses, are lightweight +durable -stainless steel frames with akulon coated screws.